Prana Lounge is the new wellness centre in the heart of leafy, prestigious Colombo 7. Prana Lounge is set in a period colonial house, all white staccato walls, original Victorian tiled flooring, loving restored by its founders Annie and Anja. The yoga Shala has a 100 year old hand painted ceiling which looks like the temple fresco’s in Dambulla Rock temple. The high ceiling and thick period walls make the Shala cool and airy, perfect for yoga and meditation practice. The Retreat was packed with detailed information on what the energy of abundance and prosperity is, how to live your life in freedom and ease, while working on the blocks that oppose this process. 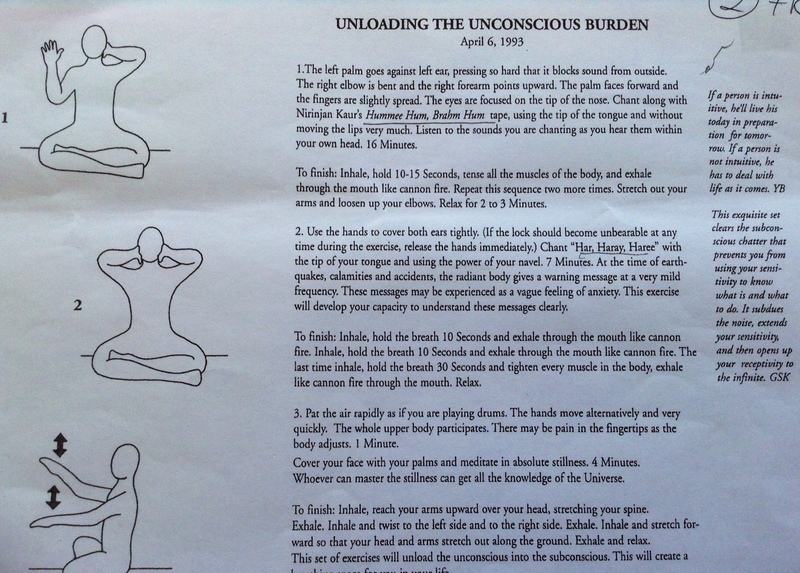 We used the science of Kundalini Yoga and meditation. We explored the universal principles of attraction and magnetics, the Gong relaxation, inspirational readings, the silence of being, I, HERE, NOW practice, combined with an introspective review of our patterns to peel away a layer of the onion skin of persona to SEE our deepest fears, limiting beliefs, genetic patterns which were blocking the flow of abundance. The program concluded with creative visualization on how to allow yourself to receive abundance and prosperity, the outflow principle and in practical terms what we needed to do each day to develop our ability to accept the natural abundance in the Universe. 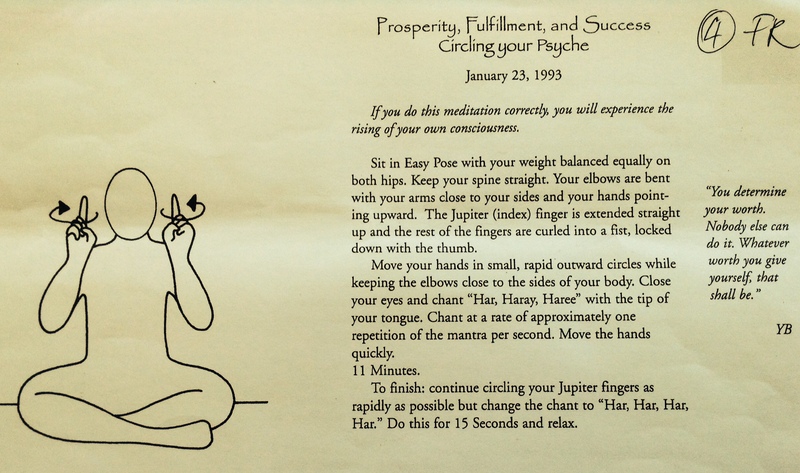 We have included a meditations and kriya for abundance and prosperity to practice at home. The vegan, lunch was just a treat. A huge bowl of organic, roast, root veggie, quinoa and herb salad, dressed with a tahini, soy sauce sweetened with kitual pani. The delicious rice salad had organic rice, chickpeas, sweet peppers, herbs dressed with jewels of pomegranate. Dessert was buffalo curd and organic kitual pani, served with cool mint tea. In the afternoon we ended the day with yummy orange, vanilla, kurakkan juggary cake and herbal tea. Pre-heat your oven to 170 degrees centigrade. Making sure your butter is at room temperature, whisk butter and juggary until light and fluffy. Now slowly add your beaten eggs at little at time, whisking vigorously to make sure the mixture does not curdle. Finally add the vanilla essence, orange rind and half the orange juice. Sieve in the flour, kurakkan and baking powder and mix well. Once you have a silky smooth mixture, pour it into a small baking tray and bake for around 20 mins or until golden. Do not overbake this cake as kurakkan can be quiet dry. 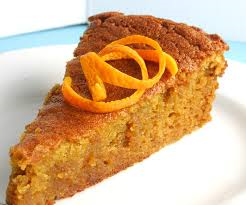 While the cake is still hot make small holes with a folk and spoon over the remaining orange juice. Now leave the cake to cool and serve sprinkled with icing sugar and a nice cup of herbal tea. Find out more about all Sanasuma’s events and classes taking place in Colombo and UK. Watch out of our International teachers coming to Sri Lanka. Join our blog and Facebook following as we grow our Kundalini Community in Sri Lanka. bloghttps://sanasumainsrilanka.wordpress.com. Just for your info our website address is http://www.sanasuma.co.uk/index.php And our Facebook name is https://www.facebook.com/pages/Sanasuma/203581616391361 (please become our friend and press the like button). I am very happy to give you the good news that I have finally found a venue and I will begin teaching Kundalini Yoga in Cambridge, UK next Wednesday 1st April. I have found a lovely space at St Pauls Church, Hills Road in central Cambridge. 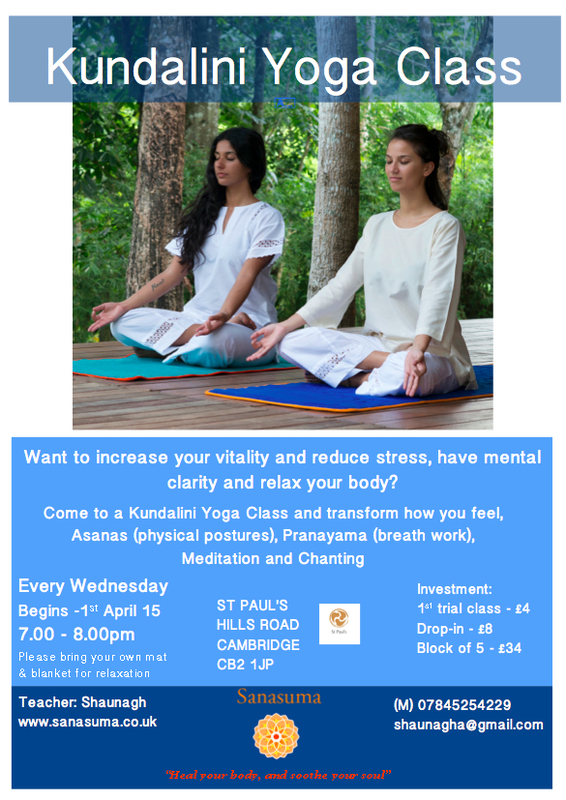 This venue is a short walk from my home and is busy with people coming and going all day, so I am hoping many people will see my flyer and come a try a Kundalini class. For those who know anyone in the Cambridge area please do pass on my flyer and class details.